You’ve settled into parenthood by now and with the help of a feeding and sleeping schedule, you have mastered motherhood. As baby sleeps longer stretches, you are finally catching up on sleep so fatigue is less of a problem. Those feelings of baby blues and sadness should have diminished by now, though some women experience subtle symptoms of baby blues for longer. If you are still feeling down, anxious and moody, you may be suffering from postpartum depression. It is estimated that up to 20% of women suffer from depression after giving birth – there is nothing to be embarrassed about. Talk to your OB/GYN, family physician or other trusted healthcare provider about your feelings. Baby is learning about the people he sees most often and he likes it. He recognizes your face and the faces of people he sees most often. He may even show signs of excitement when he focuses on your face. Touch, particularly skin on skin contact, is critical for his development. As his sense of touch develops, he will grow more interested in materials he can touch. He is getting better at bringing things to his mouth, so be careful what you place near baby or in baby’s hand. 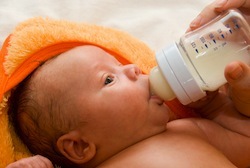 Baby should be breastfeeding or formula-feeding as the primary source of food until about six months. Some pediatricians support parents trying iron-fortified rice cereals between four and six months of age. Rice is a gentle grain that is less likely to cause an allergic reaction than other cereals. At first feeding, introduce baby to the cereal with a small, infant-sized spoonful of cereal. Never add sugar or other spices to baby’s food. Your baby will give you cues that he is ready to start eating food. If he acts interested in your food or remains hungry after breast or bottle feeding, speak to your pediatrician about starting baby on rice cereal. Baby has a well visit in his fourth month. He will be getting several vaccinations at the visit, including Rotavirus, DTaP, HiB, PCV and Polio. The pediatrician will also weigh and measure baby’s length and head circumference – as you’ve grown accustomed to over the last few months. The measurements will be plotted on a growth chart to make sure baby is growing adequately.